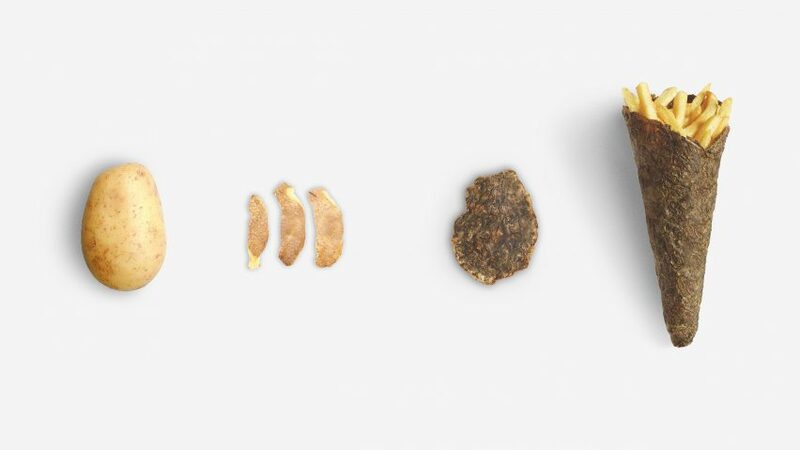 Italian designers Simone Caronni, Paolo Stefano Gentile and Pietro Gaeli have created an ecological packaging for fries made from recycled potato skins, as a sustainable alternative to paper. Called Peel Saver, the packaging is made of starch and fibre components that, after maceration and natural dying, bond with each other and harden. The designers came up with the project after realising how much potato peel waste is produced by fries companies. They wanted to put this waste material to good use – and realised ironically it could be used to contain the food it is made from. "Traditional street food packaging has a very short time of use, immediately becoming hard to recycle. Peel Saver is a sustainable remedy whose aim is to replace plasticised paper packaging," said Caronni. "Fries are thus served inside the same peel that originally contained and protected the potato, returning to the natural state in which it was." First the creators macerate and naturally dry the potato peels, before spreading them out into a circular mould. They then roll the resulting substance into a conical shape, much like an ice-cream cone. According to the designers, the initial idea was to combine the peelings with a natural glue such as gelatine or latex. However, after experimenting with various recipes they realised that the potato peel could provide a sufficient solidity on its own with the right processes. As the packaging is made from 100 per cent potato peel, it is also fully biodegradable, returning to the biological cycle by becoming fertiliser for plants or animal food. "Peel Saver shows a different point of view, a return to simplicity and to what nature already designed for us," said the designers. "We are satisfied with the process above all from the point of view of simplicity of concept and sustainability," they added. "Today it is now a necessity that products and packaging are sustainable and recyclable, this project is a proof of how much can still be done in this direction." At the moment, the designers do not have sufficient funds to support the large-scale production of the packaging, but hope to continue the project and possibly find a company that could help them make the design a reality. Other designers exploring ways to create sustainable packaging include Polish graduate Roza Janusz, who has created an alternative to plastic food packaging using a material made of bacteria and yeast, which can either be eaten after use or composted.